￼￼￼Crown of Thoughts, 2014. Filmed and photographed at White Sands National Monument. Photo by Zac Cam Studio. It was grey and early in the afternoon when the trained pulled into Beacon Station. No birds broke formation low above the water when the train continued on. Though my knees shook softly on the platform from the eighty-minute train ride from Grand Central. Jayoung had told me it was better to exit towards the front of the train. I walked down the stairs. I didn’t mind the rain. It was one of those days where you felt like everything was going upwards, evaporating into the sky. Everything cycles back. Sure enough she was waiting in the parking lot with the window slightly down. She has this tiny, round car. I remember thinking it was cute, but hours later after dinner I couldn’t remember which car was hers. I get in and soon find out that her studio is minutes from her house. We arrive at a brick building, serious and designed on a grid. Fitting for artist studios. Jayoung tells me it used to be a high school. Red lockers still line the hallways. The floor is checkered in browns. Door frames are blue. As she pulls out keys to Room 111, Jayoung tells me that there’s a location in Chelsea run by Mr. Cohen. I look more clearly at a paper sign. It reads ‘Ethan Cohen Beacon’ with a c​ube frame drawn in pen below. She opens two doors to get us into her studio. My eyes immediately wander. What strikes me is how delicate her sculptures are. Upon closer inspection, the discipline and meticulous precision in hand-knotting them becomes apparent. I begin to wonder how many lifetimes in hair are represented, and how little it must weigh on the skin. 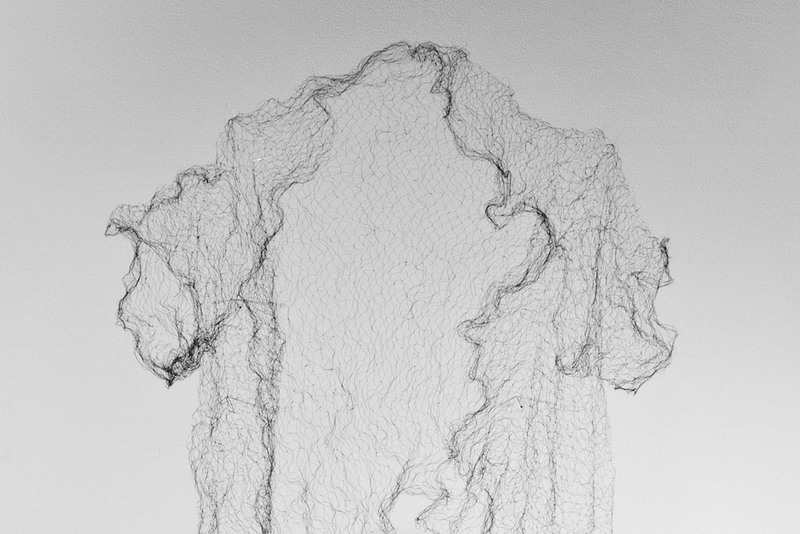 ￼Robe, 2009, human hair, wearable hair sculpture in Jayoung’s studio. Polaroids by author. ￼The Robe (detail), 2009, human hair, wearable hair sculpture. Photo by Zac Skinner. Jayoung uses human hair, often her own, as material for a ritual art practice of embodiment and spirituality. Spirituality runs in the blood so to speak. Her Korean mother’s beliefs grew in the overlap between Christianity, Buddhism, Hinduism, and shamanism she notes. She takes my jacket and hangs it next to her own on a rack in the back of the studio. Jayoung tells me that a personal turning point in her artistic practice came about when she attended a spiritual retreat in Korea in 2006. At the retreat, she began to look acutely inwards. She wondered how she could separate blind stimuli from reactions. Eckhart Tolle’s P​ower of Now b​ecame an important text. She had admired the paintings of Francis Bacon greatly. After the retreat, she no longer painted but moved toward sculpture incorporating thread. She gave me more of the history. Though Jayoung works across sculpture, video, performance and drawing, we mainly focus on her wearable hair sculptures, hair thread objects and video. From 2007 – 2009, she completed her MFA in Fiber at Cranbrook. It was during that time she began to explore hair as material sculpture and performative object in video. Mostly with the help of friends, she shaved her hair three times at Cranbrook. Though seen as a strong break from traditional appearances of women in Korea, Jayoung affirms that shaving her hair is not a feminist act. It is a move to be neutral and empty. In addition to cultural meanings, hair has other connotations as an ephemeral material. “As it grows, hair represents the accumulation of time and memory,” Jayoung points out in writing. Wearable hair sculpture Crown of Thorns, from Crown of Thoughts (video), 2014, human hair, in Jayoung’s studio. Process images of C​rown of Thoughts,​2014, video, in Jayoung’s studio. As we talk in front of the latest object she’s knotting together out of hair, I see that the removal of her hair is not only a spiritually and culturally symbolic act, but also what enables her to transform a bodily material. It enables her to go through the meditative, repetitive process of meticulously hand-knotting human hair into sculptural objects, often but not always in recognizable forms of the body, for example, a hand, a foot, or a​n umbilical cord,​which she then relates back to her body by either wearing or interacting with them on video. The hair objects of corporeal parts become an abject synecdoche for the body, that then returns to the body as a tactile interface layered on top of Jayoung’s skin. 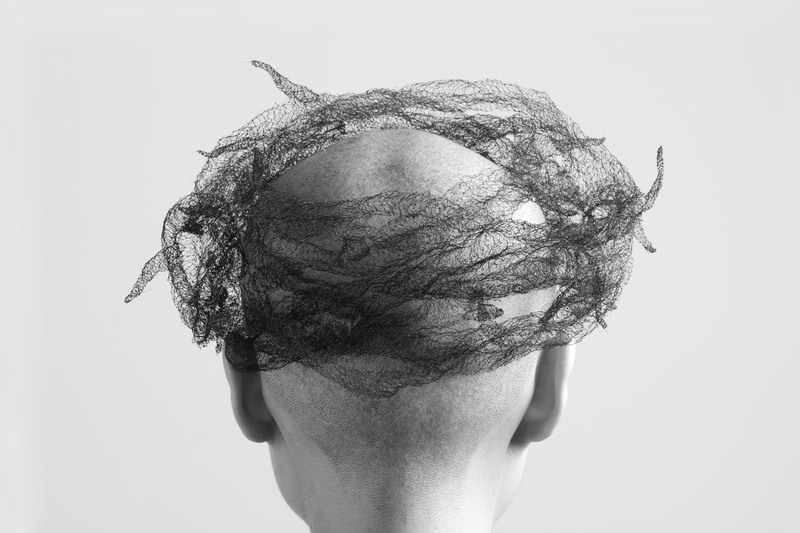 Detail of wearable hair sculpture Crown of Thorns, from Crown of Thoughts (video), 2014, human hair, on the body. Photo by Zac Cam Studio. The hair is displaced from the body, transformed into an object, and then related back to the body through performance in video. The abject is recuperated: the dead with the live, cut hair on top of skin. The body becomes the meeting point of life and death. “Since hair is the last part of the body to decay, it is also a symbol of remembrance,” Jayoung writes. Present in the act of wearing or touching the hair objects is memory and the passing of time. In observing the artist’s body relating to, and sometimes wearing, these hair sculptures, we furthermore experience an animated sensation of a body being touched. In Jayoung’s work we are often observing the artist gazing into the horizon in contemplation with bare back towards us, presenting to us a body touching something in the distance with perception. Crown of Thoughts, 2014, single-channel, high definition video, 16:9 format. Directed & edited by Jayoung Yoon. Filmed by Zachary Skinner. Her position with her back towards the camera not only orients us towards the artist’s anonymous body, but also towards the embodied act of perceiving the passing of time itself in space. This setting of her videos tend to be an endless landscape or nondescript room, in which the body is a mechanism for accessing and unfolding psychic fields of perception. As a result, the spatial field and perceptual field become sutured together in a kind of roving, slow infinite horizon. Does the geological terrain offer us a sensorial texture by which we can access an entry of experience into the body? One can’t help but also think of the vulnerability of the body exposed to the conditions of nature, and the expansive capabilities of the body when moving towards and beyond its physical and psychic limits. In displaying her self-reflexive process of slowing down her thoughts and bodily actions, she offers the audience a space to inhabit their own bodies more deeply in the present. She externalizes the internal process of slowing down the mind and impulses to create the conditions for us to become more conscious of ourselves. Jayoung’s work performs a reconfiguring of the way we relate to our interior landscapes through objectified forms, and that which physically comes from our bodies. It is therefore a meditation on how we relate to ourselves, and the performative way we relate to our own bodies. The body is both a mechanism for agency and repository for meaning, by us the viewers and the enlivening object. For example, a woman came to Jayoung’s first solo show in 2009 and bought a photograph of one of the wearable hair sculptures in the form of a hand. In the photograph, a palm extends upwards, enveloped in the sculpture. The woman later tells Jayoung she bought it because it reminded her of how she used to play the piano, and the palpable sensation of playing it. 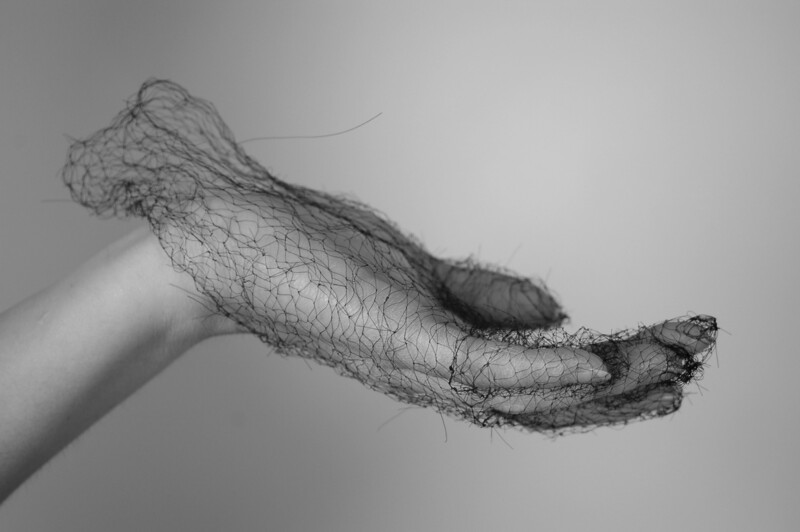 ￼Untitled (The hand), 2008, digital print of wearable hair sculpture. Photo by Zac Skinner. When I see Jayoung’s work, I think about the sensible lives and trajectories of the meaning of things. I think about what things say about us and how they make us feel in our bodies. What sensations do objects impress upon us? In this way, she grounds contexts of impermanence with embodied perspectives of experience. She brings us closer to our bodies.